The top molding was wide enough to use as a little shelf. Yea! The story of this piece is written on the back of it. It came from a historic home that was demolished in Harrisburg, Pa, our state capitol. 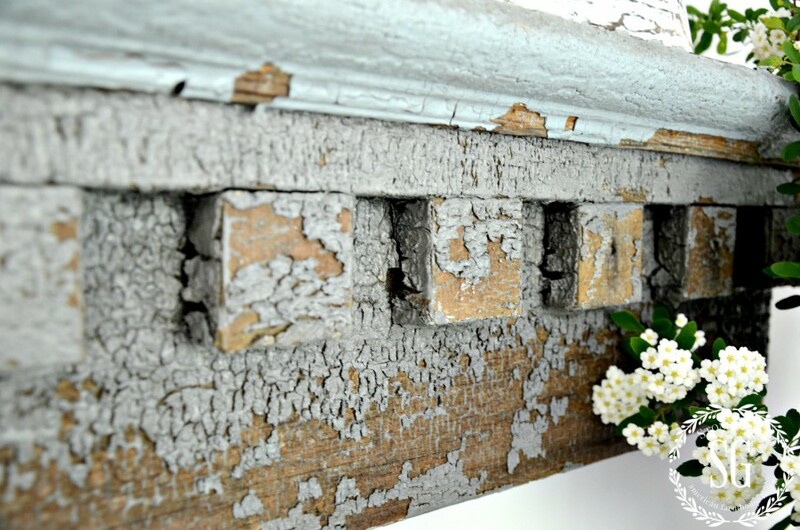 I love the thought of having a little piece of history… that a piece of crown molding with great dentil work from an historic home lives on here at StoneGable! This piece was very very inexpensive. Much less than any new shelf I could get! Don’t you love getting a great bargain! 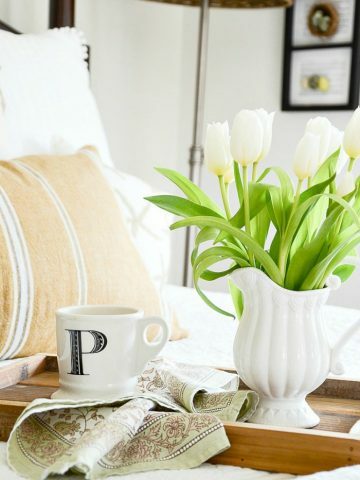 I’ll be sharing the guest room reveal later this week! Bobby and I painted it… again!!!! This room was my son Christopher’s room. When he married Abigail I began to make it over because she loves chippy furniture and etsy-style furnishings. This little shelf fits right in with the style she loves so much! Think about bringing a little piece of vintage architecture into your decor. It adds lots of texture and warmth! Remember to pin this to your Pinterest DECOR board. 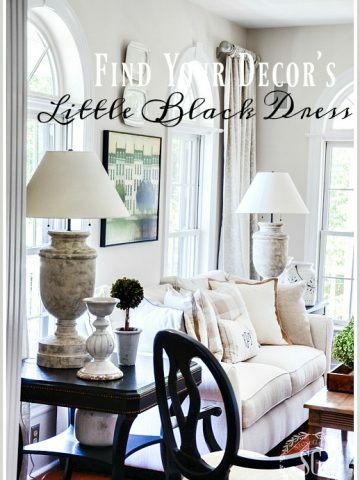 You can follow me on Pinterest and see all the fun things I am finding to pin HERE! 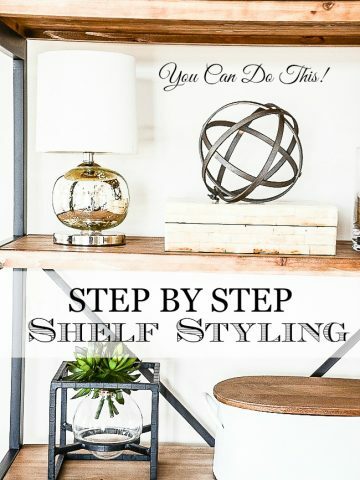 STEP BY STEP SHELF STYLING… HOW I DO IT! 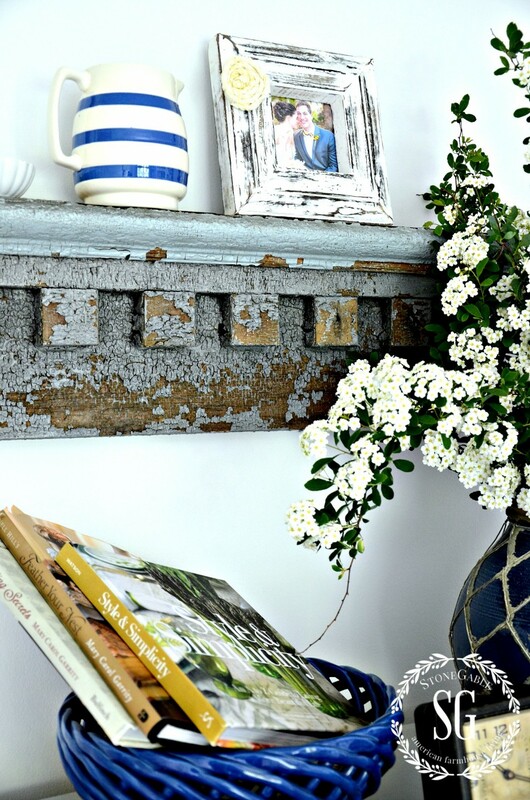 Love love love your ideas on using old vintage chippy architecture pieces! I have been wanting a piece like this to put over my bed. I just don’t know where to go to find something like that. Looks wonderful! 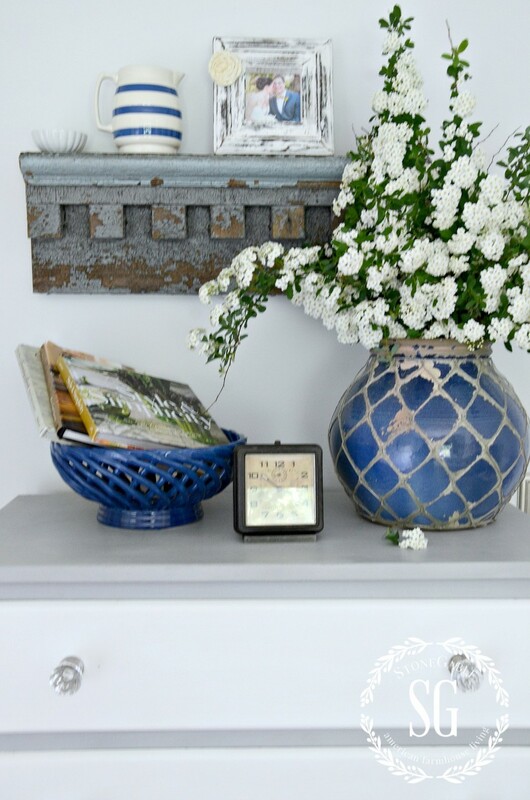 I’d love to know more about the pretty blue vase. Is there a particular name that it’s called? The whole thing is quite lovely! What a stroke of good fortune, Yvonne! It looks lovely where you’ve placed it and of course, you’ve staged it so beautifully. How wonderful that its history was included on the piece. Yvonne, I just love the look of that wonderful shelf- you really can’t replicate that kind of decrepit beauty. Gorgeous! Well, I’m not into details as some appear to be, but I do LOVE that piece and will remember such as I make the move into our new home shortly. Lovely piece! I love that the story is written on the back of the shelf – priceless! I think it is absolutely the sweetest thing that you have chosen to decorate your son’s former room in the style his wife favors. I have never heard of someone doing that and it is really a lovely thing to do. As always, I love your style. What a great piece, Yvonne! Love the color! I think you meant dentil work. Thanks Hannah. I’l never take a job as a proofreader! Much appreciated! My husband would not let me bring that into our home…he would say that it might have hidden termites which would then damage our house. It made a beautiful picture, though, especially with the decor surrounding the shelf. I put Maison Blanche clear wax on a chippy frame that was so old the clear wax just was absorbed immediately but it did not chip off anymore nor did the color change because it absorbed all the wax. I covered the inner part of frame with chalk paint and more wax. Have I set us up for lead problems now? I thought about a matte clear spray paint coat that would hold on the paint. And this pressed wood design. It would not change the color of the piece. Goodness the wax did not even change the color as the dry wood soaked it up! I’m just confused as to what I’m to do in a situation like this for I absolutely love what you found and brought home. Nothing like that here. 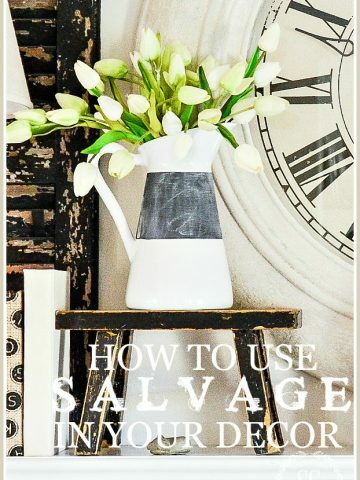 No salvage places. Gwen, I use a clear poly finish on my chippy pieces. It does not change them and keeps the paint in place. Hope this helps. I don’t get too worried about it because I don’t use chippy pieces where little hands can touch them. Thank you. I’ll do that next time for I did not want to lose the very thing that drew me to the frames in the first place. I think of all the times my Mom painted our 100 year old farmhouse kitchen. Every year. She painted the screened in wrap around porch and flooring. Our kitchen table and six chairs–every single year for seventeen years! She is 97 and sharp in the mind. We kids did not eat it nor did it get chippy for her to breathe particulates. That piece is gorgeous and an incredible find . . . so very perfect for the room and great to have a little piece of history from your home state! I love that you used it as a shelf! What a pretty vintage accent! Tell me please, are the flowering stems in the blue chippy vase Bridal Veil? It’s soooo pretty. Thanks for sharing! Yes they are Bridal Veil from the bush near the front porch! How luvly. 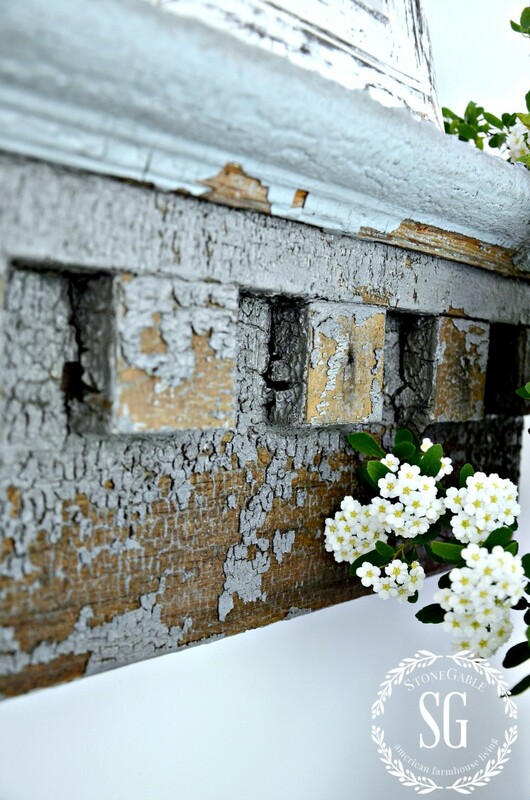 Luv all that vintage chippiness. I love it – I love anything that is unique and makes a statement. It’s especially neat that it came from a historic home in your state. I love that style but my husband does not he likes new we struggle a bit with our decor choices but this piece is fabulous! Thank you again for sharing! Yvonne, that is simply gorgeous! 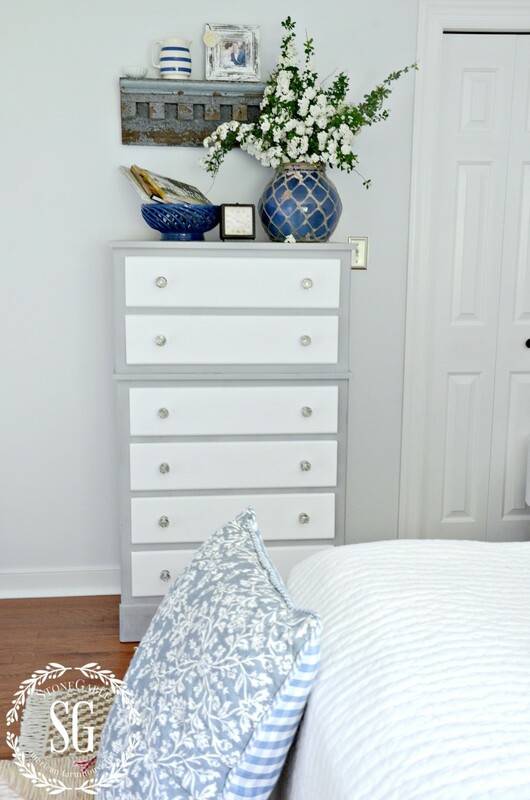 Perfect color and age, and you couldn’t have found a more perfect size for over that dresser! I just wanted to kindly point out that the “chippy” paint in this piece is crumbling lead paint! I should be sealed! I think that will make it safer. A little research may reveal that. But it is truly dangerous. Yes, I do realize that. Thanks for your concern. How do you suggest dealing with an old chippy piece with potentially lead paint? Sealing it may change the look and appeal of the piece. I have an old window that I have been waiting to hang indoors but have not for that specific reason, lead paint. The patina is so amazing. Have you figured out how you might achieve that same finish? Love the look!